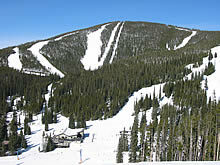 Montana has excellent downhill skiing at more than a dozen ski areas. So, as part of the sites emphasis on exploring Montana, I decided to put together information and pictures of the various downhill ski areas in Montana, complete with my own little ski area reviews. For those who have visited other "ski guides" on the net, you'll notice one striking difference between this guide and all the others. These "other web ski guides" generally are just copy and paste boiler plate information - frequently taken from the actual ski resort websites. In short, most of these ski guide sites generally add nothing new. This skiing guide to Montana, though, is different. All the ski areas listed below I have personally visited and skied at. All the content and reviews is original as are the pictures. In short, unlike other web ski guides out there, it is my hope that you will actually find the information presented here useful in planning a Montana ski trip. 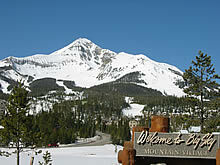 Big Sky Resort - Montana's premiere ski resort on over 5000 acres. 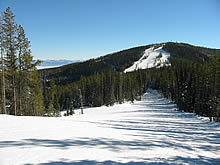 Blacktail Mountain - Family friendly skiing near Kalispell. 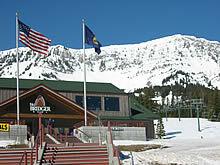 Bridger Bowl - An exceptional ski area with killer terrain near Bozeman. 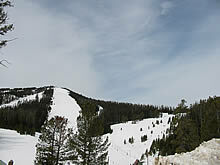 Discovery Ski Area - Excellent skiing near near Georgetown Lake. Great Divide - A large & diverse area just 30 minutes from Helena. 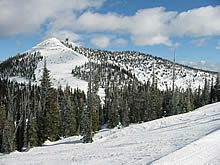 Montana Snowbowl - Excellent skiing and less than 10 miles from Missoula. 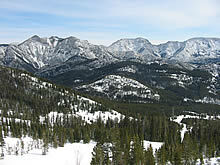 Showdown - A family friendly ski area in the Belt Mountains of central Montana. Teton Pass - A small ski area tucked along the Rocky Mountain Front, near Choteau. 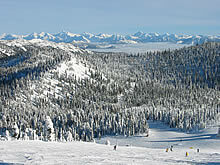 Whitefish Mountain - Located just outside of Whitefish in NW Montana. 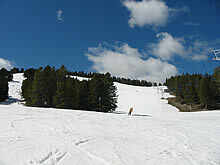 Direct links to view the photo galleries for each of the ski areas in Montana. Improve your skiing/snowboarding skills or spend an enjoyable two hours watching a Warren Miller film.